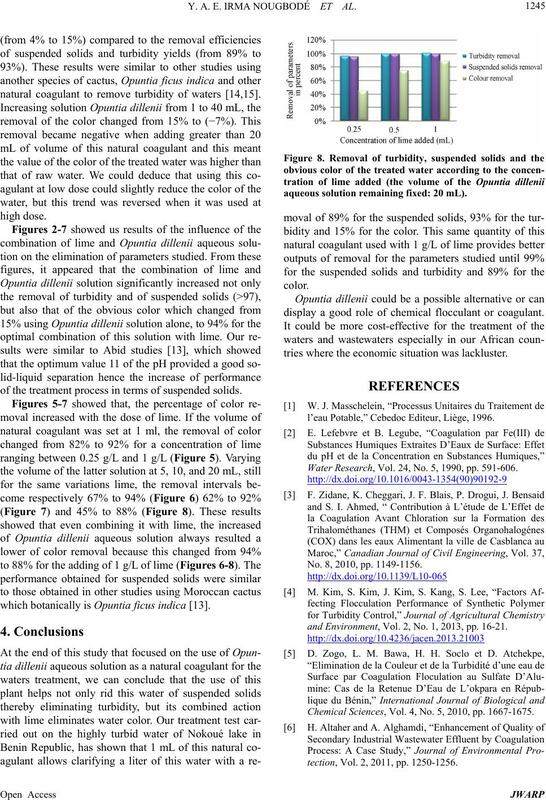 ciency of the turbidity and suspended solids became more than 95% and the one of the color between 67% and 94%. substances, living organisms and suspended solids . substance, such as trihalomethane precursors [2,3]. health and the environment . solids and some metals [7-12]. stripped of their thorns and were cleaned with tap water. a refrigerator until the use which not exceeding one week. charges due to intense human activity. 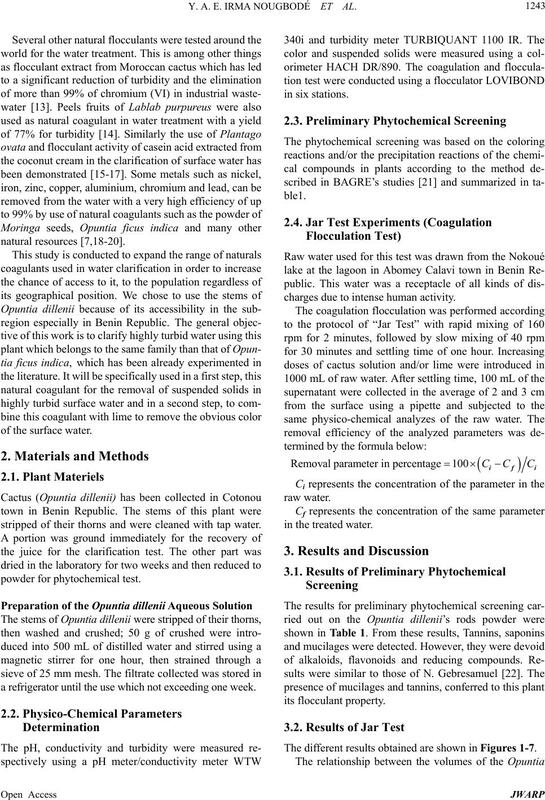 The different results obtained are shown in Figur es 1-7 . Y. A. E. IRMA NOUGBODÉ ET AL. (-) absence; (+) = presence. 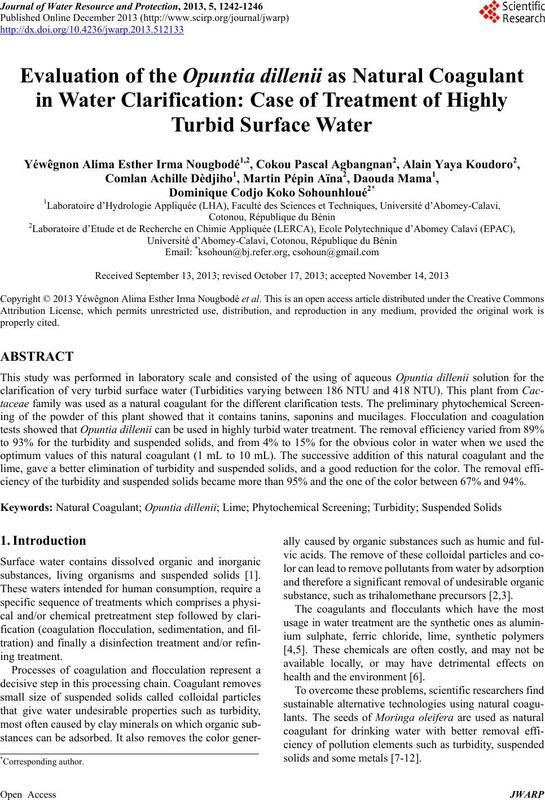 of Opuntia dillenii aqueous solution added. lime remaining fixed: 0.25 g/L). lime remaining fixed: 0.50 g/L). lime remaining fixed: 1 g/L). ous solution remaining fixed: 1 mL). solution remaining fixed: 5 mL). aqueous solution remaining fixed: 10 mL). 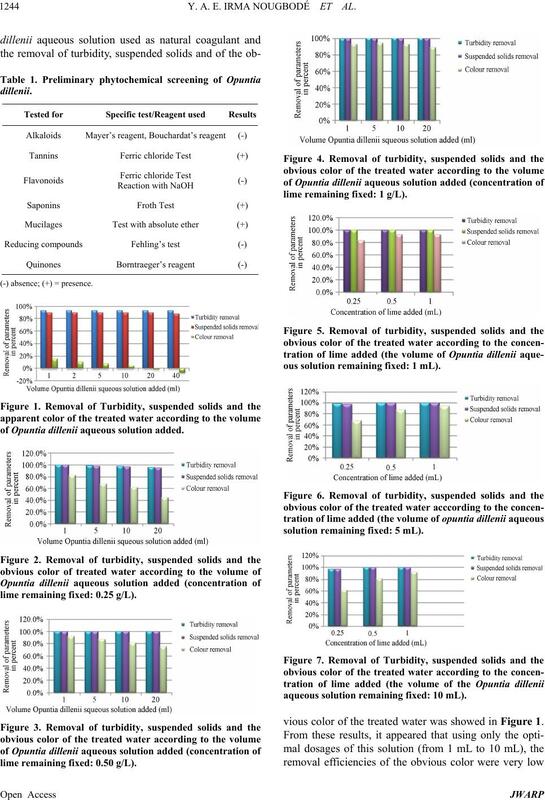 vious color of the treated water was showed in Figure 1.
natural coagulant to remove turbidity of waters [14,15]. of the treatment process in terms of suspended solids. which botanically is Opuntia ficus indica . aqueous solution remaining fixed: 20 mL). display a good role of chemical flocculant or coagulant. tries where the economic situation was lackluster. l’eau Potable,” Cebedoc Editeur, Liège, 1996. Water Research, Vol. 24, No. 5, 1990, pp. 591-606. No. 8, 2010, pp. 1149-1156.
and Environment, Vol. 2, No. 1, 2013, pp. 16-21. Chemical Sciences, Vol. 4, No. 5, 2010, pp. 1667-1675.
tection, Vol. 2, 2011, pp. 1250-1256. SOACHIM, Vol. 23, 2007, pp. 75-79. Physical and Chemical News, Vol. 42, 2008, pp. 133-138.
nology, Vol. 8, No. 1, 2009, pp. 137-139. Protection, Vol. 2, 2010, pp. 259-266. Science, Vol. 6, No. 12, 2010, pp. 788-806.
tection, Vol. 4, No. 1, 2012, pp. 79-92.
mental Engineering, Vol. 3, No. 3, 2012, pp. 187-191.
des eaux de Surface,” Revue des Sciences de l’eau, Vol. 22, No. 1, 2009, pp. 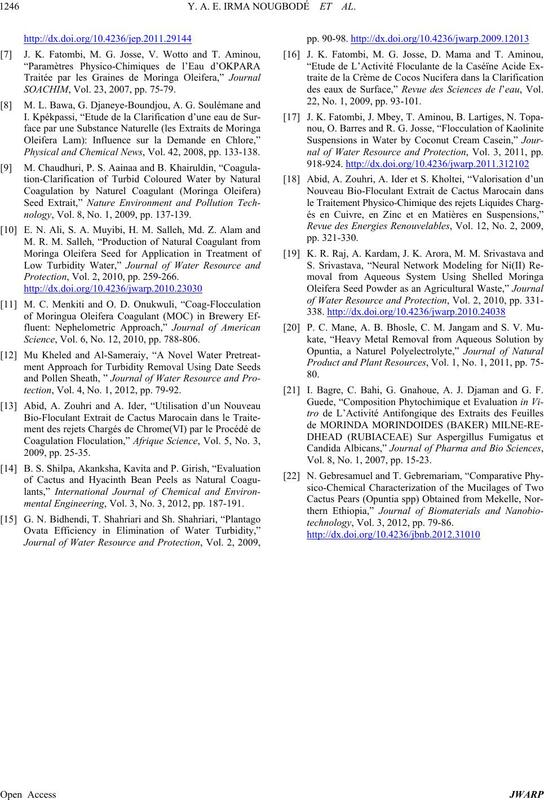 93-101.
nal of Water Resource and Protection, Vol. 3, 2011, pp. I. Bagre, C. Bahi, G. Gnahoue, A. J. Djaman and G. F.
Vol. 8, No. 1, 2007, pp. 15-23.
technology, Vol. 3, 2012, pp. 79-86.